A Quantum Leap Forward in Crosswords! It’s fair to say that the 1996 Election Day crossword, pictured above, is one of the most famous puzzles in crossword history. The puzzle “predicted” the outcome of the election quite cleverly by allowing for either CLINTON ELECTED or BOB DOLE ELECTED to read out, depending on how the solver answered seven down clues. Reportedly, Will Shortz called it the most amazing puzzle he’d ever seen. Well, that puzzle may have been topped. These rare crosswords are called Quantum puzzles or Schrodinger puzzles. These names reference the famous thought experiment involving a very unlucky cat in a box that could be alive or dead, and an observer wouldn’t know which until he opened the box. 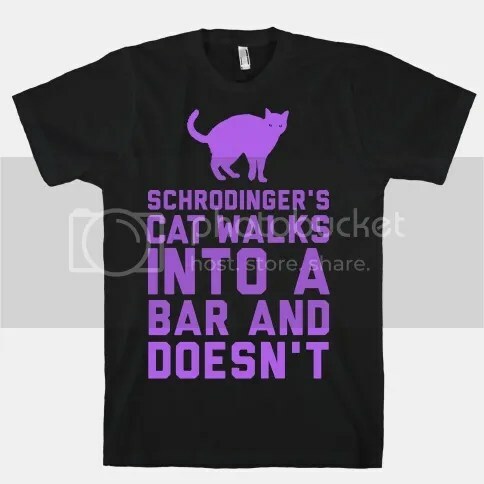 Meaning that both answers are correct at the same time; the cat is both alive and dead. Similarly, these puzzles have more than one answer, and each answer is equally correct. And on Thursday, December 4, constructors Kacey Walker and David Quarfoot combined some considerable Scrabble skills and a dynamite crossword grid to create the most impressive Schrodinger puzzle to date. You see, clues 26-Across, 36-Across, and 44-Across all feature seven letters, like a rack in Scrabble. And it’s up to the solver to find the anagram of each rack that fits the grid. 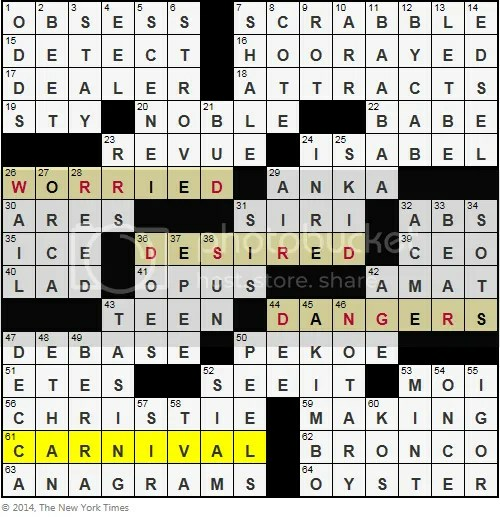 Quite amazingly, Walker and Quarfoot have designed the puzzle so that each of those clues has three possible correct answers — for 26-Across: ROWDIER, WORDIER, and WORRIED all fit the down clues — meaning there are a staggering 27 possible correct solutions! This is David Quarfoot’s 41st NYT published puzzle and Kacey Walker’s first! Talk about setting the bar as high as you can. This is also one of the flat-out coolest puzzle constructions I’ve ever seen. My thanks to Deb Amlen for doing such a great write-up on the puzzle and for pointing it my way. This entry was posted in Games, PuzzleNation, Puzzles and tagged anagram, Cluing, constructing, construction, crosswords, David Quarfoot, games, Geeking Out, Kacey Walker, New York Times, New York Times Crossword, Pop culture, PuzzleNation, Puzzlin' fool, Quantum puzzle, Schrodinger puzzle, Scrabble, Will Shortz, Wordplay by gmdirect. Bookmark the permalink.